I have been picking up bits and pieces of information on the Russians and their communities over the past few weeks. Here is some of what I have learned. I will relate some of it to Doug's job as principal of one of the Russian schools. There are 3 Russian communities at the "end of the road" past us on East End Road: Voznesenka, Razdolna & Kachamek Selo. Each of them has their own school which is part of the Kenai Peninsula public school system. Razdolna has just had 5 new homes built in the past year (very nice, vinyl siding, modern) and they are talking of an addition on the school. Other Russians integrate into the community in Homer where there is another Russian school. Razdolna is 5 miles off the paved East End Road, down a gravel road that was just built a few years ago. Many of the locals have never ventured down there, which is why when Doug asked around to find out where his school was, no one knew! It took us a couple weeks to finally find it, which is the way that community wants it! Voznesenka is down the switchbacks, which were built by Billy Jones' grandfather (the people we're renting from). Back in his grandfather's days they went in to Homer twice a year--drove down the switchbacks to the beach and rode the beach into town. These roads are very steep, and I was a bit nervous driving on them (for those of you who know me, that's saying a lot!). I was relieved to find out Doug will not be driving to that school every day! Kachamek Selo appears to not have a road to it at this time, only a 4-wheeler trail. It is down on the beach below the other two villages. All of these villages are within a mile or two of each other; I am not sure why they are separate villages. The Russian women and girls all wear long, beautiful dresses with belts around their waists and a sort of head covering like a scarf that trails down their back. The women I have seen have all had dressy sandals with 1-2 inch heels. They are all very poised, with excellent posture and graceful. Men and boys wear baggy pants and long-sleeved shirts with a belt around their waist (around the shirt, not the pants). They tend to have dark complexion and hair, unlike the women I've seen who are all fairly pale with lighter hair color. The familes are large, 6-12 children. Children often stay home from school to do chores or tend to their younger siblings. They also have days off school during the week at times due to religious holidays. Girls may marry as young as 13, boys are usually 18. Many practice the Old Religion, which I won't attempt the details of here, though I know it includes fasting from meat, dairy and sometimes oil on certain days. As I discover more, I will add to this. There is much to learn! The Alaska Highway is over 1300 miles long and gives new meaning to the word "remote". Alaska seems positively tame compared to the Yukon Territory. And while it took us 3 days of hard driving to even get to the beginning of the Alaska Highway from Michigan, that 1300 miles seemed much, much longer. While Mileposts magazine, the self-proclaimed bible of British Columbia, Yukon Territory and Alaska, states that the entire AK Hwy is paved, it is not. We met perhaps 40-50 miles of gravel roads on the way. In the Yukon Territory, that was a relief because the frost heaves were so bad that we could actually drive faster on the gravel roads. We got through it with only a chip on the windshield of the UHaul and one headlight bashed out from a rock. The roadwork did not slow us down more than an hour the whole trip. Most stops were for 5 minutes here or there. The longest wait was on the Tok cutoff in Alaska, which was 20 minutes. Luckily, we were stopped right by some portapotties so that was our break! A number of small gas stations were closed on the AK Hwy. When we asked one gas station owner about that he said that with gas prices so high, fewer people are driving the highway, and they have gone out of business. He said it costs a lot just to get the gas there, so the high prices are justified. While no one wants to pay a lot for gas, I made a point to thank someone at every gas station for being there. That country is so remote, and once you leave Dawson Creek (the start of the Highway), there is so little out there. I cannot imagine living in that seclusion. And yet those people see so many people with dreams and stories pass by. Few people just "happen" to drive the Alaska Highway. For those in RVs or campers, they may have planned this trip for years. For those in UHauls, they are moving to a new life, whichever way they are going. Wildlife on the Highway was neat. Bison, moose and mountain sheep were regular treats. Aurora also saw bear and caribou on her trip up. Supposedly bear are a common sight, and we were really hoping to see some, but did not. We drove 4000+ miles in 6 days. That ended up being 12 hour days, and one day, a 15 hour marathon. What with regularly going through time zone changes, and the constant vibration of the vehicle, it took us a good 5 days to recover feel like our feet hit the ground once we got here. The UHaul was very comfortable! I expected to have a sore back or behind, but I did not get sore at all until after we got here and started unpacking! 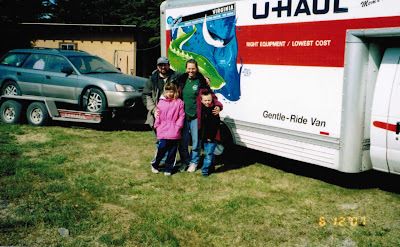 Driving the UHaul was easy, and despite the car in tow and being fully loaded, it made it up most hills with ease. Having a 7-year-old boy in the front seat with us the whole way wasn't as bad as I thought it would be. The routine was, the person who wasn't driving would read to Denver or talk to him for a little while and then sleep until it was time to switch. Then the other person would read or play with Den, then sleep. Denver managed to occupy himself quietly most of the time, though a couple evenings he started his loud, silly singing. He drew, played with his hotwheels, did math problems in a workbook or even occasionally slept. The first two nights we slept in hotels, then we camped for three nights, and the last night we stayed in a cabin. Camping was free to reasonably priced. Just before we reached the British Columbia border we stopped at a petting zoo. They said if we paid to go through the zoo, camping was free. Sounded like a deal to us. The highlight of the zoo was catching a loose rabbit and returning it to its cage! Mileposts Magazine bills the Pink Mountain campground as the best campground on the Alaska Highway, and that is where we camped one night. It had co-ed bathrooms and showers (yep, you read that right!) which was a little weird. The highlight of that campsight was playing hacky sack with a young couple from B.C. I haven't played hacky sack since I was a kid, so it brought back lots of memories. The third night of camping was somewhere further along the AK Hwy in a nice, sterile RV park that had a little grassy section for tenters. Our last night of the journey was in a cabin that most people would probably not consider staying in. However, we were not willing to pay $175/night for a simple hotel room, so we kept driving and the cabin became our only option. It was very comfortable and cozy, and since it is light out all night, not a big deal to walk to the bathroom. I'm afraid we didn't take many pictures of the journey. We were pretty focused on getting here. For once, the destination not the journey. Personally, I recommend driving the Alaska Highway just for the experience of it. However, I know Doug would say differently!! Before I finish I have to share one story. When we crossed into Canada from Minnesota, we had to declare firearms, and give the seriel number, stock length, etc. We weren't thinking when we packed the gun in the mom's attic, the very far forward part of the UHaul. Customs officials weren't going to let us off without the information, so we were going to have to dig that gun out. It was packed nearly to the roof of the truck, but there was just enough space for me to climb in and scootch my way over the stuff almost to the mom's attic. One ladder had to be taken out, and with much effort I got the trampoline unstuck. A little rearranging, a trip back to the entrance to get a flashlight, and I finally got got to the gun. Whew! We learned our lesson! Above is the deck view of our house and the other is the glacier view from our house. The house is 3 stories, with a big loft. The house is less than 10 years old and is nice. Moose wander by regularly. There are horses everywhere you look. The kids love the trampoline and spend hours bouncing on it & playing imagination games. Overall, it is very comfortable. Everyone we have met so far in Homer has been incredibly welcoming. There is no sense of snobbetry, superiority, or uppity-ness. It has been refreshing. I guess I was expecting people to be like, "Nah-nah. We were here first," but everywhere we go there has been an openness and interest in who we are and where we are from. People have been very comfortable and to us it already feels like home here. In church we got lots of hugs (kind of weird!). The people we're renting from said they knew we would fit in because we have a Subaru Outback, the hottest vehicle in the area right now. We heard that things were a lot more expensive up here....and it's true. In the grocery store, things are 50 cents to $2.00 more expensive, nearly across the board (at least the things we buy). Prices are generally cheaper at the Fred Meyers in Soldotna (like Walmart), but still more expensive than Michigan. Eggs are about $3.99/doz. ; don't ask me why they are so expensive. Milk varies from 2/$6.00 to $5.00/gallon. There are two wholesale stores in Homer whose prices don't make me gasp quite as often. The grocery selection is actually greater than Gaylord. The ethnic selection is impressive, as are the organic and health food sections. Gas prices in Homer are $3.19/gallon right now. The further north you drive, the cheaper gas gets. We even saw $2.99/gallon somewhere north of Anchorage. Of course, after pay $4+/gallon all through Canada, anything less is a relief! Dollar menus don't exist at McDonald's here, and the deal at Arby's that was $5.95 in Gaylord is $6.95 here. Restaurant prices are higher here, but reasonably priced food can be found. It's not so bad that we'll stop eating out. Utilities are just about the same as what we were paying in Michigan, at least for the house we will be living in (which is comparable since it is the same size). Gas, electric, phone, internet service, etc. are almost exactly the same. Cats lined up and making breaks. Things are under control on Homer side; out of control on Ninilchik end. If you have heard about the forest fires in Alaska, there is a big one near us. As of now, it has burned 20,000 acres. It is in the hills about 10 miles NW of where we live. The first morning of the fire it looked like smog over the city of Homer. By the afternoon there was a huge, brown cloud obscuring the sun in an otherwise clear sky. Small amounts of ash fell on our house. Day 2 there was no smoke visible from our house, but when we drove up the road one mile we could see huge billows of smoke. We drove above timberline and looked down on the fire area. The people whose house we are renting have cabins out in the area where the fire is heading. They were out there running firebreaks to save their cabins. Day 2 cont. The Forest Service officially hired our landlord and his family to help fight the fire. They own a roadbuilding business and have the Cats and other heavy equipment needed to create firebreaks. Moose are a common sight here in the Kenai Peninsula. Last week as I was driving home from Homer a baby moose raced me along the side of the road. It was running at 22 mph, through the brush! We've seen them while out hiking, in town, in our yard, etc. Most of the ones we have seen have been mommas with babies. The ones pictured above were standing on the trail at the Wyatt Nature Center in Homer. Moose can be very unpredictable, so it is very different than meeting, say, a deer in the woods. The adult moose never run away, sometimes they walk away, but usually they stand their ground. It is difficult to know whether they're going to be crabby about our invading their space, so we keep an eye on them and give them wide berth. Bald eagles are also a common sight, and it doesn't have the awe factor like it does in Michigan because there are so many. Sunday we saw an eagle's nest in a tree on Bishop's Beach in Homer. There was an adult and 2 babies in it. There is a lot of other birdlife, which we are still learning the names of. Usually our comment is, "Look at those big birds!" There is a lot of other wildlife around, we just haven't seen it. I'll keep you posted when we do! June 21 is the longest daylight hours. Further north in Alaska, the sun will not set at all, but here it does actually rise and set. When I refer to the longest day, I mean the longest day of daylight hours, not darkness hours, which you will hear more about in December. I don't know when the sun rises, because I am always asleep, but it seems to be setting about 10:30 or 11:00. However, it never truly gets dark. In the 7 days we have been here I have learned to tell what time of night it is by the degree of dusk during the night. It is difficult to put into words; it becomes something that I can sense. I do appreciate not needing a flashlight when we go camping at this time of year. Out of habit, we keep one handy anyways. Old habits die hard! People who have lived here awhile appreciate every moment of sunshine. Worship might be too strong a word, but they speak of enjoying sunshine in very strong terms.